Minimum Order: GreenTech Heat Solutions does not require a minimum order. Shipping Charges: All orders will be shipped FedEx Ground unless otherwise requested. 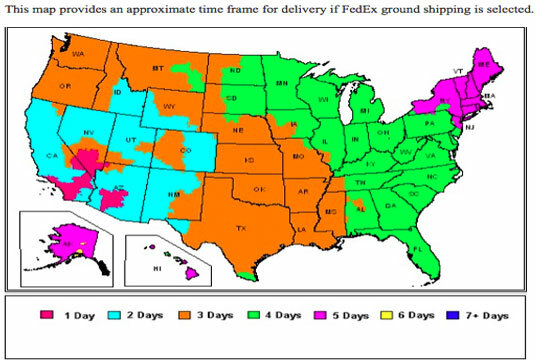 Charges are based on FedEx published rates and restrictions. All non-standard and over-sized packages may result in higher shipping fees as per FedEx published rates. GreenTech Heat Solutions may back-charge for fees incurred from FedEx for incorrect shipping address information. Please check your orders carefully. Warranty shipping and costs associated with Equipment returned for repair under warranty are the responsibility of the customer. The term "Free shipping” is from the point of origin of GreenTech Heat Solutions to the customer. Free shipping is one way only. Free shipping is only offered in the contiguous USA. Return merchandise is subject to a 15% restocking fee. The return shipping and cost is the responsibility of the customer. Deliveries of any products or packages which qualify for free shipping to any address outside of the Contiguous USA will be billed shipping separately. Delivery Confirmation: All orders will require an indirect signature for delivery. Pick Up Orders: 24 hours minimum advance notice is required. Please call or e-mail your orders 2 business days prior to the date of pick up. Order Processing Time: All orders of in-stock items will be shipped within 2 business days of receipt, conditions allowing. GreenTech Heat Solutions is not responsible for delays resulting from incomplete order information. Backorders: Items that are temporarily out of stock will be shipped as soon as the product is available. Returns REQUIRE a Return Merchandise Authorization (RMA). Restocking Fee: All returns are subject to a 15% restocking fee. Pricing: Orders are accepted on the condition that they are billed at the current price on the day of shipment. Prices are subject to change without notice. Quotes: Quotes are valid until the end of the business day noted under “Quote Expires” Pacific Standard Time. Shortages / Overages / Errors: Please report shortages, overages, incorrect or defective merchandise to GreenTech Heat Solutions upon receipt of the product. GreenTech Heat Solutions will send replacement product for damaged or defective products and issue a return shipping label for the return of the damaged/defective products. Please pack return items carefully to avoid additional damage in shipping. NOTICE: Regarding Breakage or Damaged products. Any carton that appears to be damaged or altered in any way should be opened and inspected. If damage is not detected upon delivery, your claim may not be fully honored. You must contact the shipping carrier and GreenTech Heat Solutions immediately. Goods on the invoice were received by the carrier in excellent condition, and were packed with great care by experienced packers using standard approved methods meeting the shipping carrier’s requirements. Therefore, the carrier is responsible for lost or damaged merchandise. If any merchandise is received in damaged condition, report it immediately upon receipt. Keep the breakage in the original carton and packaging for inspection by the shipping carrier. If it is not in the original carton, inspection and all claims will be denied. Transit times will vary based on your location. All orders will be shipped FedEx Ground unless otherwise requested. Charges are based on FedEx published rates and restrictions. All non-standard and over-sized packages may result in higher shipping fees as per FedEx published rates. GreenTech Heat Solutions may back-charge for fees incurred from FedEx for incorrect shipping address information. Please check your orders carefully. Returns are be subject to a 15% restocking fee. Refund is calculated on the equipment purchase price less shipping, handling and restocking fees. Items returned are at the customer’s expense. These items must be in their original condition when received by GreenTech Heat Solutions in order to receive a refund of equipment purchase price. Unacceptable returns will be returned to the customer at the customer's expense. The term "Free shipping” is from the point of origin of GreenTech Heat Solutions to the customer in the contiguous US. Free shipping is one way only. Deliveries of any products or packages which qualify for free shipping to any address outside of the Contiguous USA will be billed shipping separately. Free shipping is only offered in the contiguous USA. Return merchandise is subject to a 15% restocking fee. The return shipping and cost is the responsibility of the customer. All products sold by GreenTech Heat Solutions are guaranteed to work as described upon delivery. If in the event you receive a new product delivered not working contact GreenTech Heat Solutions immediately 855-484-2847. Shipping and costs associated with equipment returned for repair under warranty are the responsibility of the customer. Warranty repair or replace is the discretion of GreenTech Heat Solutions. The warranty on GreenTech Heat Solutions equipment is non-transferable. ePro electric heaters ship new with a 2-year repair or replace warranty. Titan propane heaters ship new with 2-year repair or replace warranty. No other warranties applied on other products except as specifically described herein. GreenTech AM4000 Fans ship new with 2-year repair or replace warranty. iTemp Wireless Anywhere and Express temperature systems including cellular transmitter, USB receiver and wireless temperature sensors ship new with a 90 day repair or replace warranty. TeGam hand held digital temperature system ships new with a 1 year limited repair or replace warranty. Hand held laser temperature sensor ships new with a 30 day repair or replace warranty. Power Station ship new with 1 year repair or replace warranty. Power Station Cords ship new with 1 year repair or replace warranty. Pharmaceutical cannabis processors, chicken rendering plants, and pet food manufacturers sanitize their equipment and processing lines with heat which improves the overall quality of their products by limiting exposure to lethal chemicals. Our equipment will zapp bug and black widow with thermal remediation.